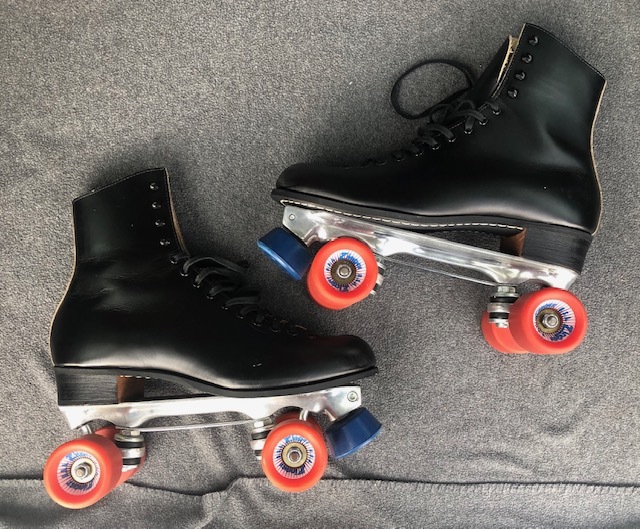 I don't know anything about Pacer skates, but those look like a decent low-end quad. Good for starters. 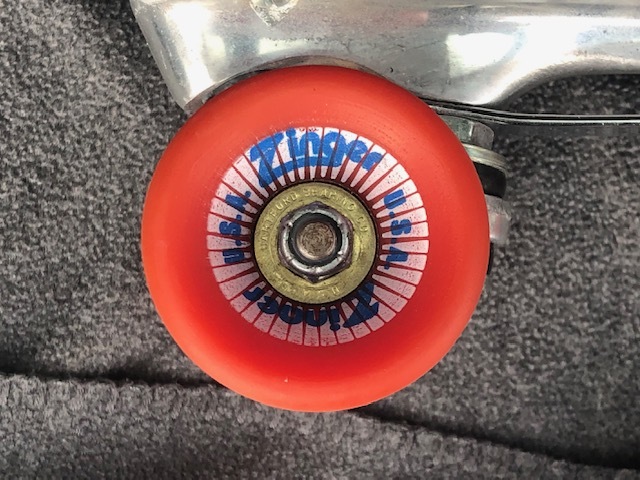 As you progress, you will probably want to upgrade to something else that is tailored to your skating style. Well the boots are stitched so,that's a good start. Fine for a beginner,hey even an expert that only skates once in a while. Pacer is generally a low cost value plate that lots of us got our start on. Down the line you may want to change the plate for a more precision action plate. I should have done a little more explaining - the boots were a big part of why I snagged these. They're '80s or '90s Riedell, Red Wing made 120s & just oooze quality. The leather is soft & supple and thick. They're size 11, which is what has generally worked for me in rental skates - I'm an 11.5 in normal shoes usually, but 12s seems to big for skating. I'm sure nicer boots exist, but I'm pretty sure these are already way nicer than I deserve. The bearings roll great. I ride skateboards & have sets of Bones Swiss I could throw at my skates, but for now the wheels & bearings seem to have a great smooth ride. RE: the plates - that's the biggest part I'm questioning. The bushings are simple rubber & the kingpins are flat head screw type. Both charming vintage touches that I assume are probably negatively impacting the setup. From the responses above, sounds like I'm on the right track there. I'd been interested to see how these plates would perform if I could retrofit modern bushings & kingpins, but perhaps thats a waste of energy? They do LOOK very nice in person. SO - what would a killer bang-for buck plate be that would work with these boots? I'll likely never get into any kind of really fancy skating, but I would like something that could be used for shuffle. Those are good. Much like a pair of skates I had in the 80's. Some folks could skate that skate for a lifetime, others would look for something different. Depends on skating style. That could be a forever skate if you want to do JB/Dance skating. If you want to go fast, you would want something different. If you're a beginner I'd be inclined not to change anything yet. Those look like a decent set of intro skates. I'd only advise making sure the wheels are correct for the surface you are running on (softer for outdoor, harder for indoor). Skate for a bit, build up some skills then see what is a limiting factors (plate, wheels, cushions, bearings etc). Don't spend money before you have to. Those are good. . . That could be a forever skate if you want to do JB/Dance skating. If you want to go fast, you would want something different. That’s cool! Had to look up JB - I grew up in Northern Indiana & Chicago, but didn’t skate much and had no clue about this style. Any baseline tips on adjusting the bushings as I learn? I’m sure it’d be good to have some movement there so I’m not trying to learn on a stiff setup. And I’m not sure the two are adjusted equally, so I’d like to learn that. Also: I’m most comfortable with only the bottom laces done - any issues with that? Last edited by drasp; April 8th, 2019 at 03:39 PM. Also: I’m most comfortable with only the bottle laces done - any issues with that? Well, there are urethane cushions. I use them, and a lot of folks get better turning, and a livelier ride from them. They come in four colors: blue, yellow, purple, and red. (this is the Sure Grip version. Powerdyne has their version with different colors. They go from easiest to turn, blue, to hardest, red. A starting point would probably be yellow, depending on your weight) They are most often used in a barrel cone configuration. The barrel will be nearer the foot, and the cone will be nearer the floor, narrow side nearest the floor. What is a little funny here is, your skate has a regular king pin, not a reverse king pin. 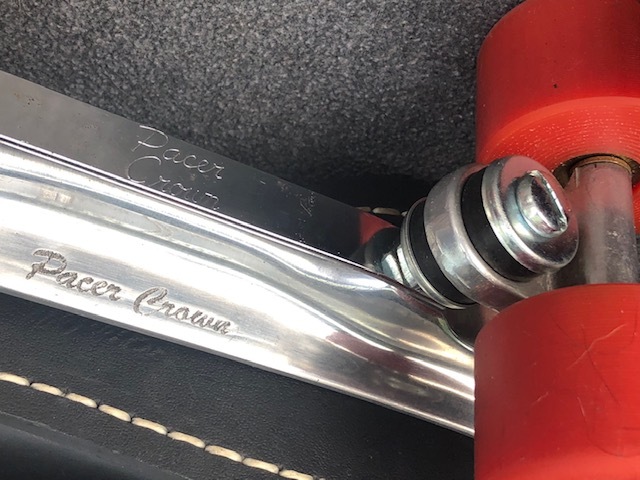 In a reverse king pin setup, the king pin is a bolt sticking out of the plate, the cushions and trucks go on the king pin, and at the end, holding things together is a nylock nut. I have never put a barrel cone setup on a normal king pin skate. It really shouldn't matter, but, to me, it seems funny, and I simply haven't done it. At any rate, you could order some urethane cushions and it will give you more turning, and basically more response overall. They will also be less likely to get a (bad) memory. Get skewed and stay that way, the way happens on rental skates. One skate wants to go one way, the other skate a different. If you order them, they can likely install them at the rink. Check with them. To get a smoother ride you could just loosen the trucks (before changing the cushions). Sometimes they are so tight when you get them, that it feels like you're on rails and can't turn easily. I'd recommend that first off. Just loosen them one at a time and skate on one foot. Try to go around a circle (on one foot)... first on your inside edge and then on your outside edge. If they're too loose, you'll feel like your falling over. If they're too tight, you won't make it around the circle. Then you'll adjust it so it's just right and you'll love it. Also, what are bottle laces? Oh wait, bottom laces? possibly auto correct? That's absolutely fine. Not a lot of people lace up all the way, just do what ever feels comfortable. One thing I do know from buying vintage is those rubber cushions will get hard as a rock after a few decades so you might want to see about changing them. Thanks for the additional responses! Yes, meant “bottom” laces, just edited the post. The Sure-Grip Avenger DA45 can handle most anything you want to do. If you don't like the modern look of the Avenger there are other Sure Grip plates that can use the same trucks. If you are swapping bearings with skateboards be sure to get the 8mm axle version.